omid (mashhad, Iran) on 1 November 2018 in Documentary & Street and Portfolio. Love the image. Have never seen anything like it! Fantastic composition from the biker. Fantastic play of shadows on the ground from all these umbrellas above ! a great perspective and composition with this cyclist ! superb colors ! Fantastic colors and shapes. Love the umbrella. That is an impressive alleyway. The umbrellas make a lovely pattern on the floor. Wonderful road for the cyclist ! A powerful and fun hallucinatory visual. Excellent play of colors and shadows! Superb composition! ...............in a colorful environment, beautiful picture. Oh, lost between shades and colors !!! What a colorful arcade with the umbrellas above! Excellent symmetry in this PoV as well. 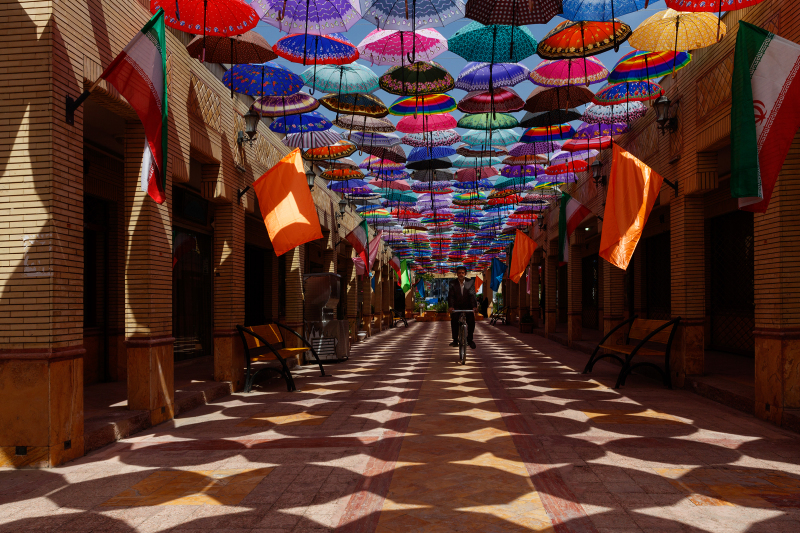 A beautiful capture with the shade of these colored umbrellas that looks like a paving on the ground. Plenty of umbrellas overhead! I like the patterns of light and shadow created. On such a street, it's easy to ride a bike. Beautiful effect created by shadows. Color superb - Congrats on the Color Spotlight ! Congratulatios Omid with this spotlight photo. Bravo pour ce superbe spotlight my friend !!! Beautiful photograph. Congratulations on Spotlight. Love colours and graphism here. Excellent Omid. Stunning photo! You really deserved this spotlight! Sorry I missed it! excellent, et si il pleut, il est protégé! !